Highly pathogenic porcine reproductive and respiratory syndrome virus (HP-PRRSV) is a variant of type 2 PRRSV with high virulence. Genetic and pathogenic characteristics of HP-PRRSV vary rapidly during the evolution. In this study, we determined the complete genome of a HP-PRRSV isolate designated 10FUJ-2, which shared 98.34 % nucleotide identity with HP-PRRSV reference strain JXA1. Genomic analyses by phylogenetic tree and recombination detection program confirmed 10FUJ-2 to be a recombinant with 09JS and JXA1 as potential parental viruses. 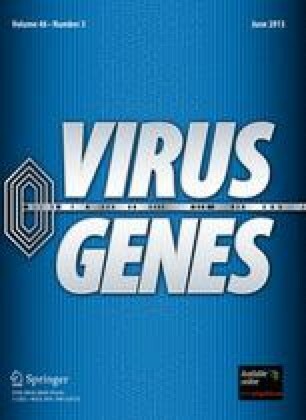 Furthermore, we identified that 10FUJ-2 has high virulence as similar as the parental viruses by animal challenge study. In addition, we found that SY0909 was also a recombination virus probably from JXA1 and NT0801, which has been reported to be low pathogenic. Recombination analysis also revealed that Glycoproteins GP2 to GP5 of HP-PRRSV might contain major virulence determinants. Identification of two natural recombinants with different virulence supports the notion that recombination is a driving force affecting HP-PRRSV pathogenicity and a common mechanism contributing to HP-PRRSV evolution. Nanhua Chen and Xiuling Yu contributed equally to this study. This work was supported by grants from the National Scientific and Technical Supporting Programs (2006BAD06A07, 2008FY130100-2 and 2009BADB4B05-3) and the Scientific Achievement Transformation Program (2009GB23260435).